I began to hire people to do the things that I just didn’t have time for or want to do myself. Then there was that realization that time = money and I can use my time in so many other ways. Something that would take me 5 hours to do (like unhappily attempting to format my website!) may take an expert only 1 hour. I could be doing something SO much more important with that time. Sharing in the groove and changing my mindset was next. I’ve discovered that in letting go of so much of the DIY, I have more time for me, for my family and for my biz to organically grow. My first big win in this department was when I hired someone to redo my website 2 years ago- what a GAME CHANGER. John of Renaissance Web Solutions became my graphics designer as well and the two of us have created amazing things together. My friend Daniela Balzano– an incredible artist, did my drawings and then John turned them into the most adorable little buttons to represent my biz in all the most incredible ways. We created the Mindful Yoga Breaks card deck and Anchor Breath poster & the Superhero Breath card deck and poster. Had I not reached out to someone else to do my website, all that came next would never have happened. I opened myself up to others to step in where I needed and my biz is at a whole other level. I am able to keep sharing my expertise and knowledge while others do the work behind the scenes to make it all come to fruition. It’s really exciting. I LOVE having this team around me. My favorite new partnership is working with Jen Byer of YoPlay Yoga 4 Kids. She and her family spent the last 5 months here in New Haven and we were able to do so much work together in laying the groundwork for an exciting future with Mindful Yoga Breaks. She and I have been collaborating together from afar for the last few years and having her around the corner made a huge difference for us. The creative juices were flowing non-stop and if I didn’t allow for this to happen, it would still be lonely old me, slugging away on my own day after day. Together we have so many ideas, so much fun and so much to share. I cherish the time spent creating together and we’ll continue this partnership long-distance even while she is abroad with her family, despite the bad internet connections and weird time differences. Stay tuned for all the goodness we are creating for teachers! I can’t wait to share soon. I’m so proud of my new & improved website that we’ve been working really hard on – step inside, take a look around and then let me know what you think! In order to grow and change, it may require you to rely on others to do so. I have always said – “why should I pay for that when I know I can do it myself?” But I let go of that mentality and I let all sorts of people in to do all those things I thought that only I could do. It’s taken so much weight off my shoulders. What part of your biz (or life) do you continue to put off and find to be such a chore? Most recently in my biz it was the bookkeeping, but in my personal life- it’s cleaning, really deep cleaning. I finally hired someone to clean up my Quickbooks and someone to clean our apt once a month and both are seriously some of the best things I did for my sanity & my family. Your biz is your baby and it’s hard to give up that control when you hire others to do what you normally do. I’m still working on this one but allowing others to take over things you normally spend a lot of brain power on can be very freeing. I gave someone my Quickbooks passwords and shared my bank statements – say what??? That was tough. Find time to spend on yourself in your day- take a yoga class, have lunch with a friend, get a pedicure, go for a walk, etc. When you invest in yourself, you are able to be there for everyone else. As you read in my last blog post, Self Care is my word of the year so I’m finding that adding it to my daily routine in different ways is changing my approach. Even just listening to my book club book or a podcast instead of NPR has changed my brain. I am limiting my intake of social media and the news and it’s so much better for me. Look to work with people that maybe you normally wouldn’t have worked with before. Find people doing other projects that sound interesting and get involved! I find that partnering with an organization I believe in to fund-raise for gives my biz and life a purpose. I am currently doing donation family yoga classes for IRIS here in CT and Mindful Yoga Breaks is partnering with Amal Alliance. In the past I raised money and worked with the Africa Yoga Project, 108 Monkeys & Sandy Hook Promise. 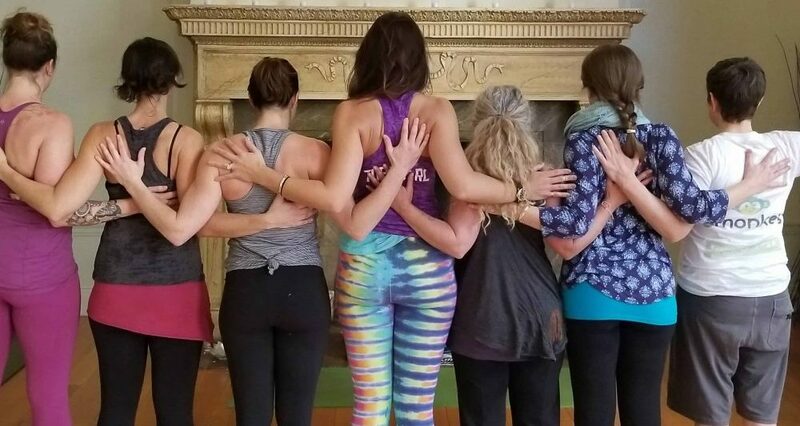 A group of us worked together on a yoga fundraiser for a family in our community who has a child going through the unimaginable right now. Seva = Selfless Service in yoga and this is how I create that much needed balance between receiving and giving. You can find all my donation based family classes here. How do you THRIVE in your biz/life? What is working for you? What did you let go of? thank you Laura! I should also give you a shout out in my blog post- my writing wouldn’t be so awesome without you! love you!